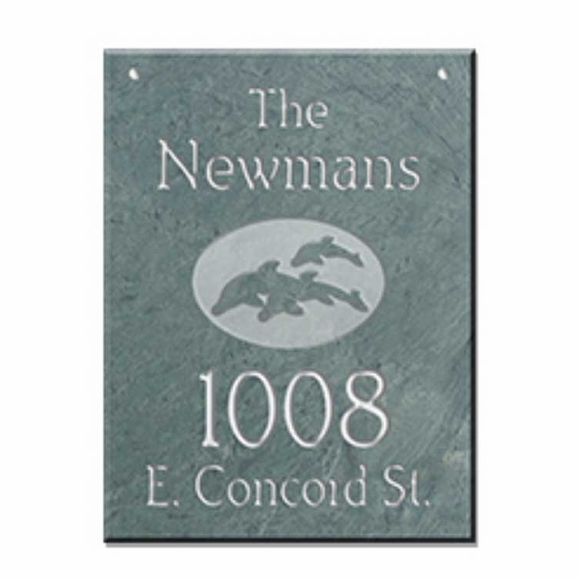 Hanging Address Sign with Dolphins - - slate address sign. Seaside theme plaque features three playful dolphins swimming in the center. Personalized with the family name, house number, and street name you supply. Made in USA. The one-sided sign has the name & address you supply and the dolphins on the front only. The two-sided sign has the name & address you supply and the dolphins on the front and the back. (Note: personalization is exactly the same on both sides). Vertical orientation with four lines of wording and dolphins in the center of the sign.